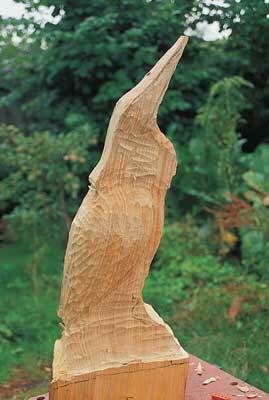 I am a very fortunate wood carver. To reach my workshop I walk the length of a 100ft garden, passing two fishponds as I go, often putting the local heron to flight as he tries to satisfy his epicurean tastes for exotic carp. 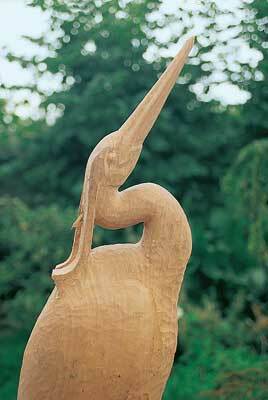 This beautiful bird - probably one of the most instantly recognisable species in the country - is the kind of subject I like to carve as the chance of someone misidentifying a finished sculpture is reduced. For example, someone might say, "That's a lovely blackbird you've carved there," when I've spent 100 hours working on a ring ouzel. 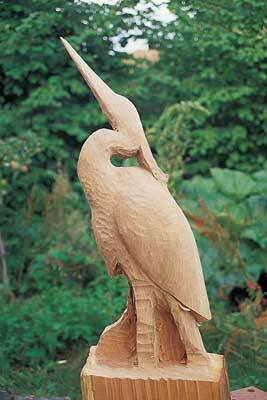 It also struck me that I had never seen two herons in the garden at the same time. 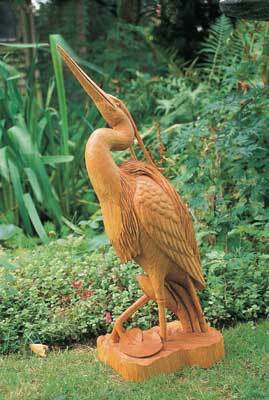 Consequently, I thought that if I were to carve a heron sculpture, not only would this be a pleasant addition to the garden, but it might also fool the avian Rick Stein into thinking his seat had been taken and he should take his custom to a neighbour's pond. 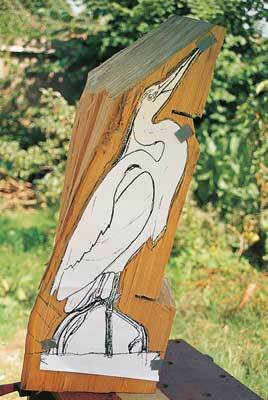 Herons are about 91.5cm (36in) in length, so a life-size one will require a substantial piece of timber. I used a single piece of sweet chestnut (Castanea sativa), but oak (Quercus robur), ash (Fraxinus spp), cedar (Cedrus spp) or lime (Tilia vulgaris), would make suitable alternatives. You could form a large block by laminating several pieces together. 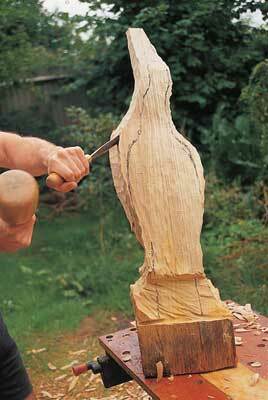 If carving from a single piece, make sure it is from a quarter of a trunk and not using the full diameter. This will greatly reduce the chances of it splitting over time. Try to find reference photographs taken from as many angles as possible, and do try to observe the real thing. Using the reference dossier, draw a simplified design as viewed from the side and from the back and/or front. Then find some wood that best matches the intended size, and enlarge your drawings by photocopier accordingly. The reason I work in this order is that on too many occasions I have produced the final plans for a piece of work, only to find that the one piece of suitable wood is half an inch too small along one of its dimensions. Remove the bulk, see panel, then roughly flatten one side of your chosen timber. 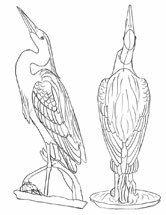 On this surface - which should relate to the side of the heron - draw with black crayon the outline from the side-view template. Put some reference marks on both template and wood so that each time the template is offered up it is easy to relocate. 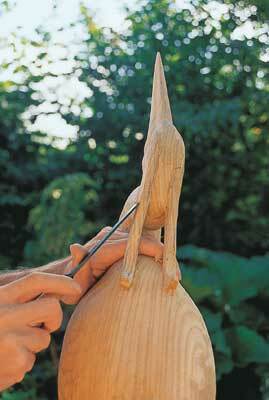 Carve around this outline, keeping the cuts at 90 degrees to the surface with the side view profile you have just drawn. around, repeat this process for the back view. Be careful when offering up the template that it is not bent around any curves in the wood as this will shorten the profile being transferred to the wood and result in material being removed from where it shouldn't. 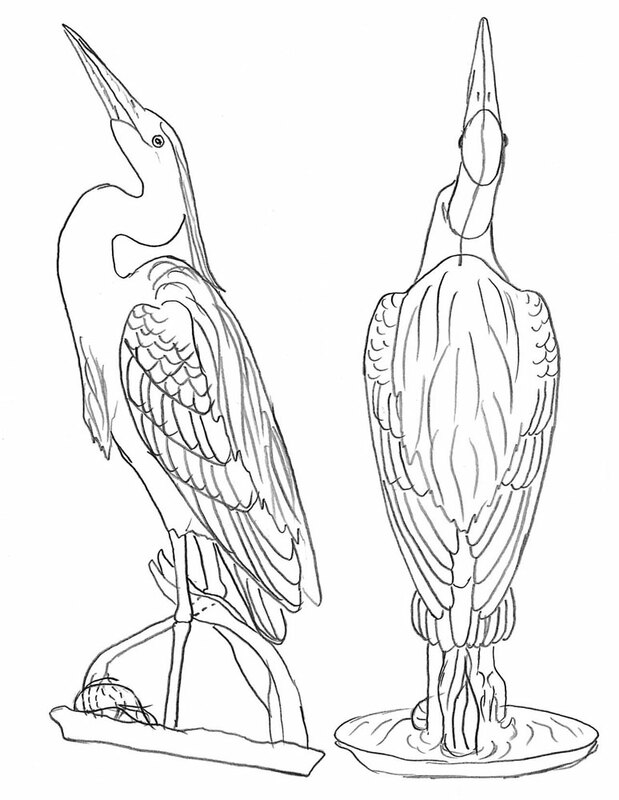 While removing the bulk, maintain the centre line of the heron's body, even if it needs to be redrawn several times. This gives the approximate line of the spine and provides a good reference point from which to maintain a symmetrical cross section of the head, neck and body. Now cut a line with a 13mm (1/2in) 45 degree V-tool to define where the nape plumes - the tufty bits - end, and round off the back of the wings. Then, again using the V-tool, define the leading edge of the wings, having first marked the position using the template. Using a 19mm (3/4in) No.8 gouge, round off the chest and belly area. Work over as much of the carving as possible - leaving the weak points like legs and other thin sections until last - to a fairly rough level of detail. Then start again and go over the whole piece to the next level of detail, and so on until it is completed. Working this way helps keep all the various parts of the subject in proportion with each other, and also provides a little leeway in the early stages for changes in design, to allow for small miscalculations or mistakes. Define the area forming the gap between the back of the neck and the nape plumes, here extended beyond reality so that they can be left attached to the back of the wings for strength. Make a couple of holes through this area with either a drill or, as I have, by rotating a gouge while hitting it with the mallet. 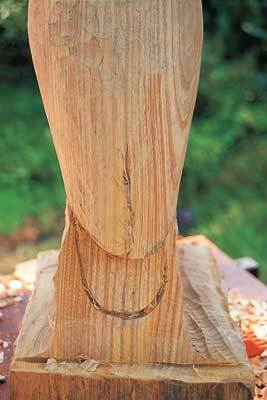 Join the holes up and shape the area, making sure not to carve the nape plumes too thin at this stage. 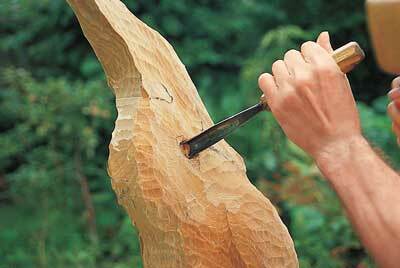 Using a 19mm (3/4in) No.6 gouge, start rounding off the top of the head, the neck, chest and beak. With the V-tool, define the lines of the legs, see Give it strength panel. Draw the lower edge of the tail feathers and run along this line with the V-tool, curving the upper surface of the tail from one side to the other. 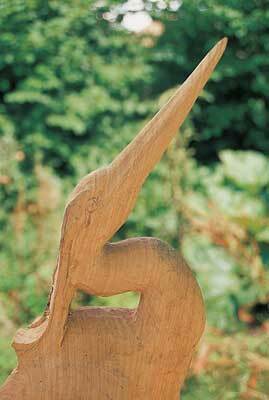 Moving back up to the top of the heron, note the way that the head and neck are offset to one side to provide a natural look. Mark in the line separating the upper from the lower mandibles and run along it with a 6mm (1/4in) V-tool. Then recess the lower mandible with a flat chisel, so that it fits within the upper. Take care with grain direction - if you misread the direction of the grain in relation to your direction of cut, larger than wished for flakes of wood can be dislodged. 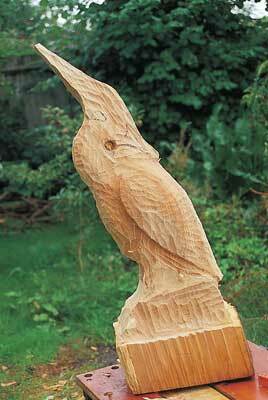 Re-carving the whole area can easily rectify this on a region of substantial bulk, but when getting near the tip of the beak - or any other small-sectioned area - there is little room for error. Using a 13mm (1/2in) No.10, form the tapered grooves along the upper mandible that are positioned along the line of site. Also, define the line where beak ends and feathers start. The beak area can then be sanded with 180 grit before putting in the nostrils with a scalpel blade - I use a Swann Morton handle No.4 with a No.26 blade. Mark on one side of the head the central position of one of the eyes. Then, using a compass or dividers, measure its distance from the centre line from a point between the eyes and transfer this across to the opposite side - scribing an arc in the approximate position where the eye should end up. Then, measure back from a point towards the tip of the beak to the first eye marked, and transfer this measure across to the opposite side again. The point where this mark intersects the first line transferred is the central position for the second eye. Look from above and then from the front to make sure that the eyes are not wonky. Now draw an almond shape around the centre points of the eye. This line equates to the upper limit of the upper eyelid and the lower limit of the lower eyelid. Carve around this line with a 6mm (1/4in) No.8 gouge, then dome the area within these lines from top to bottom and side to side, using a small flat chisel. Sand carefully around the eye area. To finish the eyes, mark the lower limit of the upper lid and the upper limit of the lower lid, work carefully around these lines with the 6mm (1/4in), 45 degree, V-tool, then use the scalpel blade or a small, flat chisel to dome over the eyeball area within the lids. Make the corners of the eye slightly deeper than at the top and bottom, and finally smooth the eyeballs carefully with sandpaper. At this point you could also thin down the nape plumes and finish shaping the back of the neck. 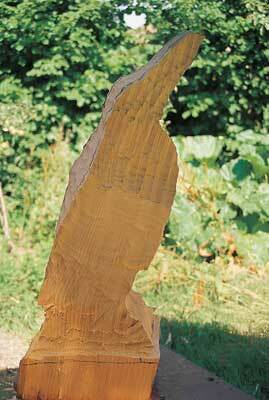 In the next part, Bill carves the feathers and legs and completes the project. The V tool is probably the most feared of all carving tools, mainly because many novice carvers can rarely get them sharp and, as a result cannot get them to function as they should. When properly sharpened they are one of the most versatile and useful tools in the carvers tool box. They do, of course cut a V shaped groove in a variety of angles and can be very useful for carving letters, fur, hair, shallow relief etc. "The head and neck are offset to one side to provide a natural look"
Power tools can save much time when removing bulk wood. If you have a large bandsaw, chainsaw, or an Arbortech-type machine - and are confident in their operation - then use them, but take care not to get carried away. Power tools will remove unwanted wood very quickly indeed, but given half a chance they will, with equal relish, also hungrily devour the wood you would rather leave behind. If you have no such machinery, it's a case of flexing those arm muscles and using as large a gouge as you can get your hands on - I tend to favour a 25mm (1in) No.9. - Fix your work firmly. The less it wobbles each time you strike a blow with the mallet, the larger the amount of waste wood removed. Because the heron's body is fairly large and heavy, but the legs are thin and weak, strength could be compromised without a bit of careful design work. I got around this by designing the subject so that the grain of the wood was travelling straight up rather than across at least one of the legs, giving strength. 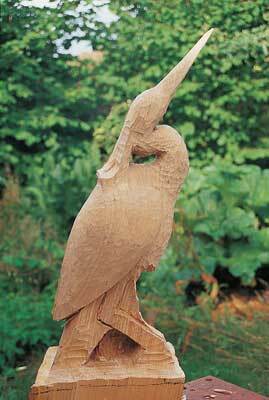 Also, I chose to carve the heron walking over the top of a strategically placed clump of iris leaves that brush up against its belly, so improving the strength between the body and the base.